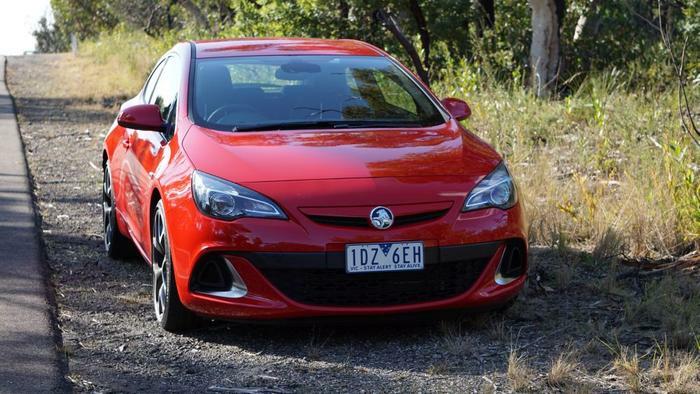 Holden’s range topping Astra VXR is no fence sitter. This is a polarising car, sometimes for the better and other times for the worse. Tearing us in two is its design. The back looks great, with its low slung roof, rear diffuser and twin exhausts. The sides follow suit as the car sits on expansive 20-inch alloys. Low profile tyres compound the effect and give the VXR a look of menace. Undermining the design tone is the front body kit. Its soft, gaping appearance gives this serious hot hatch with a smile that is goofy. The car’s interior tells a similar tale. There’s tacky plastic insets in the dashboard and the glow of tasteless neon lights. 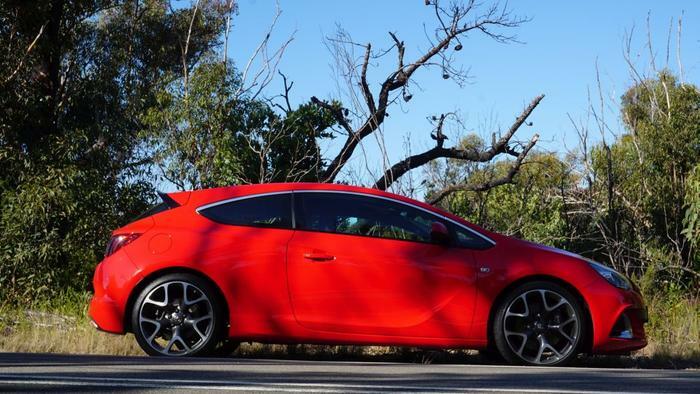 These touches leave the impression the VXR is a car for people who believe clubbing is Australia’s greatest pastime. Worsening the interior is an infotainment system well past its used by date. The version of Holden’s MyLink in the VXR does not come with a touchscreen, and it isn’t supplemented by an easy-to-use navigational method. A knob scrolls through each letter of the alphabet every time text is entered into the GPS. Compared to Ford’s rivalling Focus ST, MyLink feels like a relic. The lack of a touchscreen means the dashboard has been desecrated with innumerous buttons. A touchscreen presents only the options that are relevant at any one time. 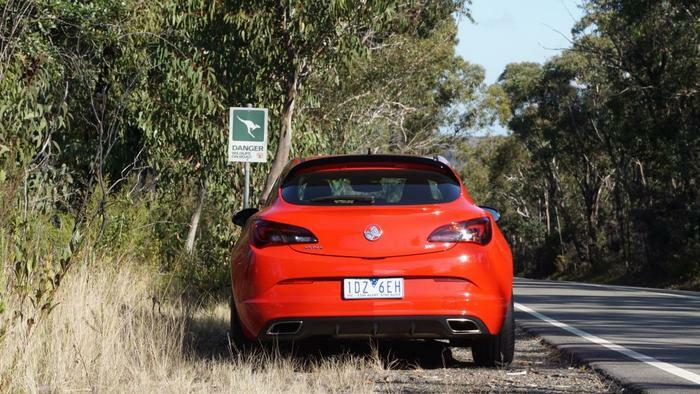 Holden’s hot hatch thrusts every available option as a button, and the one you need gets lost in the numbers. Come nightfall and some of the bold decisions begin to make sense. 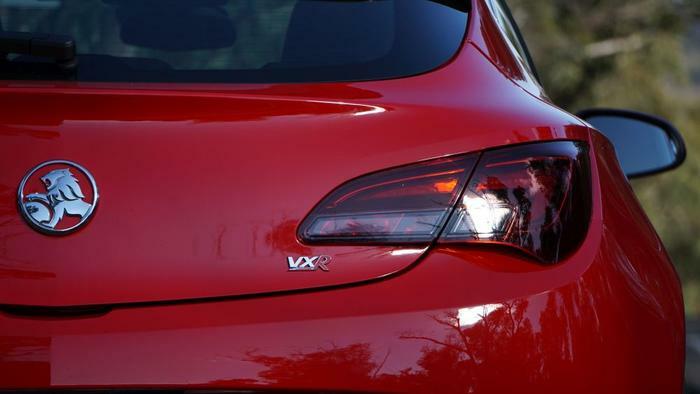 A button on the dashboard titled “VXR” turns the speedometer backlighting into a uniform red. The shifting in colourtone reveals the car’s three-stage adaptive dampers have been set to the firmest setting. Race-style bucket seats brace bodies, and because they have been upholstered in nappa leather, the hugging seats don’t negate comfort. Interior space is plentiful for a car of its size. It has a low slung roof and yet enough headroom in the back for men six feet tall. Ample leg room is another benefit; one that is often sacrificed in a hot hatch. Technically the VXR will seat five, but only four will travel in comfort. You would be forgiven for thinking the engine in this car is concerned more with economy than performance. It is of the stop-start variety and, in the real world, it will average 11.7-litres for every hundred kilometres. But economy is an ancillary concern of the VXR’s engine. It is powered by a 2.0-litre turbocharged 4-cylinder engine that will deliver 206kW of power. There’s a class-leading 400Nm of torque and it’ll reach 100-kilometres from a standstill quicker than the Focus ST with a time of 5.9-seconds. This is a quick and an involving car to drive. All of the power is sent to the front wheels through a six-speed manual gearbox. Gear shifts lack the mechanical texture found in Ford’s hot hatch, but the Astra’s clutch is noticeably lighter, which makes it less of a strain to drive everyday. Sitting stationary at the lights is set to the backdrop of the engine’s hum. Its tune is velvety warm. Accelerate and the baritone sound audibly grows. Keep it down and the tune of the turbo kicks in with a howl. The redline is at 6500rpm. Lift off the accelerator early and the engine will slowly wind down with a relenting growl. This complex melody is utterly corruptible. Matching the performance is the VXR’s handling. Large Brembo brakes bring it to a halt quickly. Turning the car into an apex is almost telepathic. It responds with enthusiasm to the softest nudge, nimbly weaving in and out of bends. The body doesn’t roll; the car squats close to the road and simply sees a line through. The power, its delivery and the handling culminate in an intoxicating experience. The VXR is small and agile enough to slip into gaps in traffic. Somehow the neon lights inside the car seem less offensive on a Saturday night. Large front windows let plenty of air in. Music, whether it’s from the radio, a hard drive or via Bluetooth, is played with gusto over the 6-speaker system. This car makes sense in the blanket of night. A Monday morning inevitably follows and the sunlight is sobering. Bright shades make the VXR a blinding eyesore. The coupe’s doors are ludicrously large, which means the interior will be scuffed, your leg will be scuffed or the alongside car will be scuffed. Exiting the driveway will have to be done slowly, or else the front body kit will scrape. Going up tall speed humps demands the same attention be paid. Responsibilities render the VXR a chore. But it's not the drawbacks that come to mind at lunchtime. What sticks long after are the many thrills had during the weekend.